PRC's "Billy the Kid" series had two different stars over a six-year period. 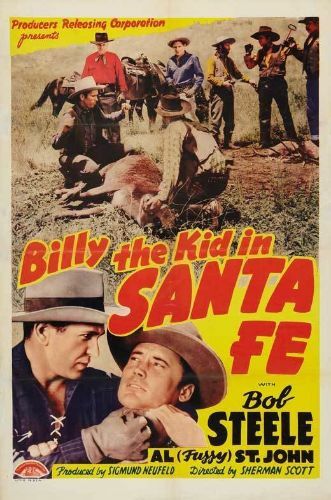 Bob Steele plays the title role in 1941's Billy the Kid in Santa Fe. Framed on a murder charge, Billy heads to guess what New Mexico town. Here he teams with the brother of the murder victim to extract a confession from the real killer. This 66-minute sagebrusher was the sixth of PRC's "Billy the Kid" entries; in late 1941, Bob Steele would be succeeded in the starring role by Buster Crabbe.